James Gurney is the artist and author book series Dinotopia. We’re here today with artist and author of Illustrated book series Dinotopia. Thank you James Gurney, for taking the time to answer a few questions. Sure. I thought I’d better get to this right away, because things get busy for a while starting tomorrow. Hi James,There’s no need to introduce you to viewers. Can you tell us how did you become interested in Arts and specially Illustration? I knew since I was about 13 years old that I wanted to do something with art, eventually. Starting in middle school, when I first encountered the work of M.C. Escher and Norman Rockwell, I became aware of how art can reach people through the printed page. I also loved science and English in high school. I was worried that if I went to study illustration right away, I might miss out on those other interests. So I put off art school and spent four years at the University of California, Berkeley, studying archaeology, paleontology, and other sciences. At first when I started at the university I thought I’d be a medical illustrator, but I abandoned that when I learned about anthropology. In my spare time from studying academic subjects, I made a latex gorilla mask with real resin teeth. I lived in a bad neighborhood and often rolled in late on my unicycle wearing the gorilla mask and a security guard uniform, and I never had any problems. After college, I had no job prospects, really. But I had just enough money saved up to move to L.A. and my goal was to learn to paint. I soon got a job painting backgrounds for the animated film “Fire and Ice,” which was co-produced by Ralph Bakshi and Frank Frazetta. As a Illustration artist what are your major principles for doing a great Illustration? l I can live inside the scene I’m painting. There’s a Latin quote that I have wood-burned onto my mahl stick. It says: “Ars est celare artem.” It translates: “True art is the concealment of artifice.” It’s easy to make a painting look like paint, but it’s much harder to make a painting that pulls in viewers so completely that they feel the heat of sun on their neck and the sand in their shoes. Illustration is more than illusionism, of course. What really matters to me in the end is to what extent a given work connects the viewer with the visible world and with the world of dreams and emotions. Many different modes of art can achieve that goal, but what excites me is art that does so by being sensitive both to the visual world around us, and the sea of mystery inside us. The inner eye and the outer eye inspire each other. Are you formally trained as an artist or are you self-taught? There’s a well known debate in the Art community regarding the role of education in an artist’s work versus no Art education, what do you think about this? After majoring in anthropology at UC Berkeley I did a short stint at the Art Center College of Design in Pasadena, but only for two semesters. At Art Center, I learned some very helpful material about perspective from a great teacher named Ted Youngkin. But I didn’t stay because it was expensive, and because I got hired into the animation job. I was getting paid to learn to paint. pick up a lot on your own. I got a membership to the zoo and the natural history museum and went to each twice a week to draw the animals. I developed my own curriculum of self-teaching based on The Famous Artist’s Course from the 1950’s, Andrew Loomis’s book Creative Illustration, and the teaching methods from the 19th century French academy, which involved fairly detailed anatomy and cast drawing. All this self-taught academic work was combined with daily outdoor sketching, which became such a passion that I ended up coauthoring a book on the subject for Watson-Guptill called The Artist’s Guide to Sketching in 1982. My other books, Color and Light and Imaginative Realism, were a chance to download and share what I’ve learned over the years. Since you love creating Illustration, please give us a look into your top 3 favorite Illustration (Please provide image for same), and also explain what makes them so special. Let’s start with Dinosaur Parade and Waterfall City. I began my illustration career painting paperback covers and National Geographic illustrations. National Geographic sent me on assignment to Jerusalem, Athens, and Rome on assignment. It was a huge inspiration to see those famous old cities. I spent time with Rick Bronson, an archaeologist who was just like Indiana Jones. He led me through overgrown jungles to find little known Etruscan ruins, and we descended down ladders into newly-discovered tombs. Sitting around the campfire at night, Dr. Bronson and I would talk about dreams of discovering a lost city like Machu Picchu or Troy. I realized that I could always make a painting of such a lost city, and that led to Dinosaur Parade and Waterfall City. After painting a few generalized “lost empire” paintings, I started playing with the idea of a picture book that would serve as a kind of grand tour. After that, I drew a map of an unknown island and came up with the idea of a Victorian explorer who discovers this island and reports about it in his journal. Then I thought of putting all those places on a single island, and populating the island with dinosaurs and people. I tried to immerse myself in every aspect of worldbuilding, from maps to mechanics to metaphysics, making it as real and believable as possible. I tried not to think of myself as creating the world, but instead just transcribing some lost journal. This attitude really freed me up. It’s easier to transcribe something that already exists rather than creating something from whole cloth. It took about two and a half years to write and illustrate Dinotopia, which came out in 1992, and the time was funded by the sales of art prints. Part of developing Dinotopia involved creating its deep history. Dinotopia’s ancient origins reach back to a futuristic past where advanced machines threatened to take over the island. In this establishing shot for the prequel Dinotopia: First Flight, a vast and unsettling scene unfolds itself. Giant robotic long-necked vehicles called “strutters” walk alongside floating “skimmers” modeled after trilobites. Into this dystopian past, the hero Gideon Altaire appears hitchhiking on the back of the biggest strutter. The architecture draws from south Indian temples, and the scene is lit with the weird yellow-green light of fluorescent illumination, which casts the skylight into an even stranger red violet. My goal was to use these colors to impart an unnatural feeling to the scene to set the stage for Gideon’s entrance to the natural world later in the story. As an artist, what I enjoy about Dinotopia is that it provides a venue for painting all sorts of pictures, from landscapes to portraits to still lifes, and from quick sketches to elaborately finished large paintings. 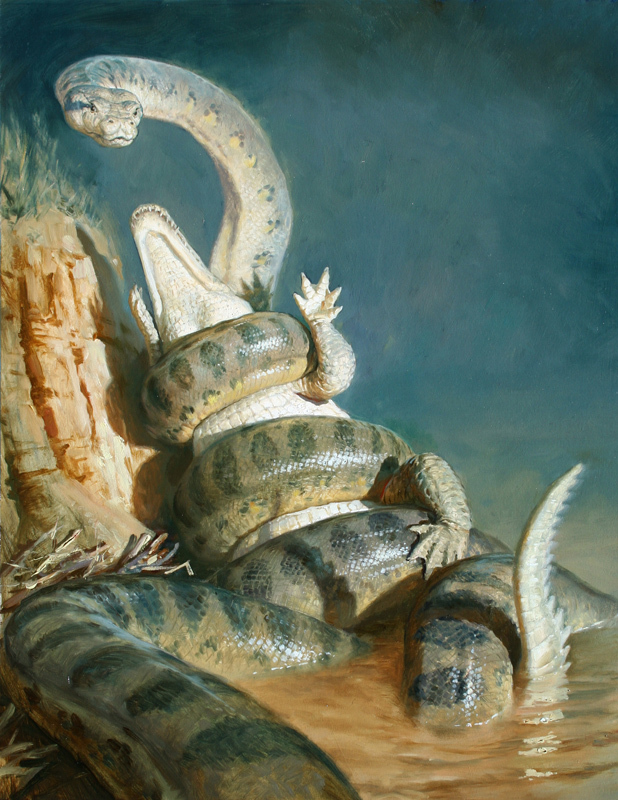 By the way, all the paintings in the Dinotopia books are painted in oil, even the ones that look like watercolor. What was the most important lesson you have learned since you started Illustration that might help the newer artist getting into Art? I would advise a young student to forget about style and to draw and paint nature as faithfully as possible, at least at the start of their career. I think it’s a mistake to dwell on developing a personal style, especially for a student, because sometimes the style gets in the way of really seeing. Also, any style eventually becomes tired and stale, but truth to nature is timeless. In my view, students especially, but also working professionals, should keep studying the world around them with close observation. It’s natural and good for young artists to model their pictures after those of other artists as a path to mastery. But I prefer my heroes to be dead, and I’ve always tried to study many different ones, not just one. We like to thank James Gurney for taking the time out to talk with us. My pleasure. And keep up the great work, guys! 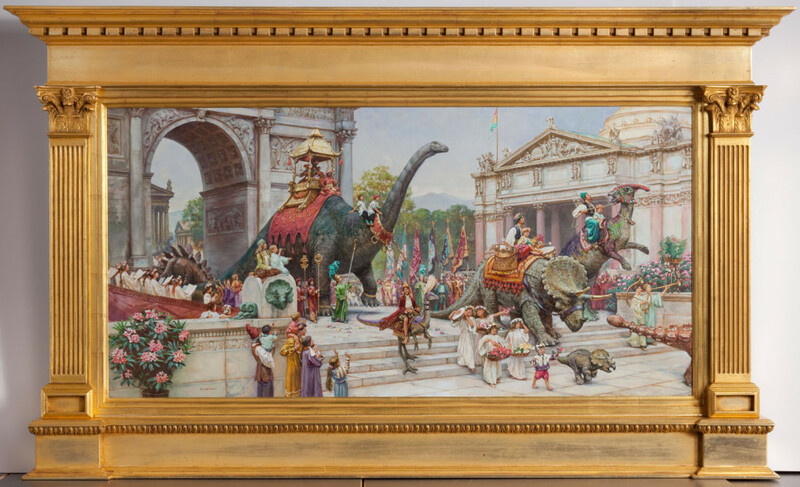 By the way, you might mention that there’s a huge art museum exhibition of Dinotopia on view right now at the Lyman Allyn Art Museum in New London, Connecticut, through Februrary 2, 2013.